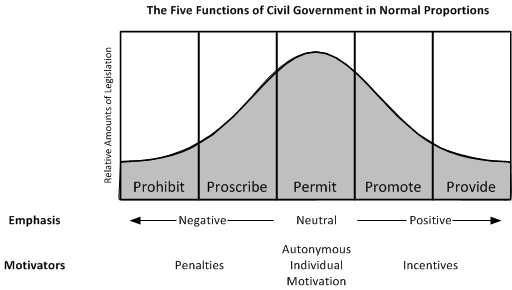 In Proportions for Public Policy – the Normal Curve, I introduced the image below, suggesting that the relative proportions of legislation should follow a normal curve (pun intended). I suggested that this is optimal for freedom and order. Let me add that I think that this represents how the American system was intended to work. My main purpose in making this proposal, however, has a goal, and that is to reduce the amount of acrimony in our society by reducing the amount of legislation that is coercive, that is, both Prohibition (making activities illegal), and Provision (redistributing money for government programs). I am not, however, suggesting a Libertarian view, which eshews nearly all prohibitions or public programs, as shown in the diagram below. Some prohibitions do make sense (don’t steal, don’t kill, don’t bear false witness, you get the idea), and some social programs make sense too. But I do want limits. In that scenario, many activities are prohibited, many are regulated, and few are permitted or free from government interference (Proscription). On the other side of the curve, lots of social engineering incentives are used to promote state goals (in the guise of helping society), and a majority of individual income is garnered in taxes in order to support a large ‘social safety net,’ providing for many things which are probably better left to individual responsibility, like housing, retirement savings, or child care. Again, my goals is to recommend the normal distribution, and then to suggest specific public policy efforts that both the right and left should temper in order to reduce public acrimony, increase freedom, and reduce government.